Tie this craft and activity in to your China or "Great Wall of China" theme if you like. It is designed to get your child thinking about his friends (and possibly his family), what qualities he values in them, and how they support him in his life. Make the building bricks shown above, or try the poster version illustrated below. This makes a great classroom or group project, too. 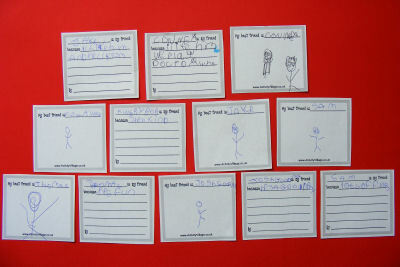 Have the children draw and write about their best friends on our cards. Cut out the cards. Wrap a mini cereal box in coloured paper (or paint the box). Stick the cards to the box. Use the boxes to build a wall. 1. 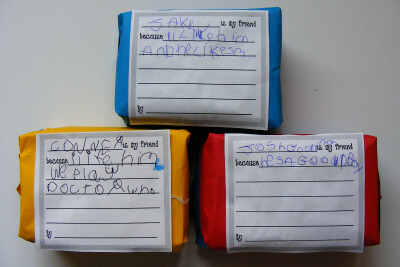 For a group or classroom project, ask each child to write about their best friend - or divide the children into partners. Alternatively, ask each child in the class to write something about a child who is leaving, a birthday child, a child who is finding it hard to fit into the group, etc. 3. Make a poster by gluing all of the friendship cards to a large sheet of paper in a wall pattern. Chinese Paper Cuts have been a traditional form of decoration in China at Chinese New Year and all year round for thousands of years. Why not have a go with the kids?